Powers Ability to create and undo any curse. Okay, here’s what I’ve learned so far. About 700 years ago, a nun locked herself away after having visions of darkness. After a few decades squirrelled away by herself, she emerged with this. Each page is made out of slices of her own skin written in her blood. I told you, it’s eekish. According to the notes I found, it’s been owned and used by cults, covens, and even the Vatican had it for a while. There’s a spell inside that thing for everything. Talking some black mass, dark magic, end-of-times nastiness. 3.7 11.09 O Brother Where Art Thou? Charlie relates that around 700 years ago, a Spanish nun named Agnes had "visions of darkness," and made it her business to undo curses. Agnes discovered that to cure a curse, she had to know how to inflict one. She learned that balance was required in the magical world; a curse cannot be without its cure. With that knowledge, Agnes spent a number of decades in isolation and wrote the book. Each page is made out of slices of her own skin written in her blood, in an encoded obscure Sumerian dialect. The book is also protected by a spell, preventing it from being destroyed by any means. The Book of the Damned has been owned and used by various cults and covens over the centuries, and even the Vatican possessed it at one point. Its last known owners were the Styne family, until they lost it in the early 20th century. The Styne family, according to Eldon Styne, lost the book for 80 years before it was uncovered in 2015 by Charlie Bradbury, who was able to locate a few historical documents that stated that the book was located in the ruins of a monastery in Spain that burned down years ago. Unearthing the book brought her to the attention of the Styne family, who sent one of their members -- Jacob Styne -- to track it down. Jacob and his men hunted Charlie all through Europe, Russia, and eventually the United States. Sam and Dean became interested in it with the hope that it could be used to remove the Mark of Cain. While Rowena eventually did manage to use the Book of the Damned to remove the Mark, she escaped with it, and the Darkness was unleashed by the Mark's removal. According to Charlie Bradbury, the Book of the Damned is a dark magic spell book for "creating or undoing any kind of damnation there is." Like all dark magic, use of the book comes with a price; when spells derived from it are used, there is a negative reaction of biblical proportions. The known pieces of information that are encoded in the book are the cure for the Mark of Cain, a spell to summon Lucifer from his cage, information on sigils that can temporarily neutralize Lucifer's powers once he is summoned, a time travel spell that requires a second witch, a spell that can create a crystal that can absorb the souls of spirits trapped in the Veil, and details on how to destroy the vessel of an angel. The book also contains a resurrection spell called the "Magice Necromantium" which requires a great deal of power, the body of the victim, and some other relatively common ingredients. Rowena tells Jack Kline that Agnes created the spell because her only friends, her fellow prisoners, were dying from starvation and death is the ultimate curse to be reversed. After acquiring the Book of the Damned, Charlie makes her way back to America with it. South of Des Moines, Jacob Styne is able to track Charlie down using a special compass that points in the direction of the book. When he and his henchman attempt to take the book from Charlie she goes on the offensive and is able to escape, but not before being shot. Wounded, Charlie calls Sam and Dean to tell them of her predicament, and that she has found the Book of the Damned, and it may hold the key to removing the Mark of Cain from Dean. With this new information, Sam and Dean direct Charlie to one of Bobby's old hunting cabins to lay low until they can get to her. While preparing to leave, Dean finds a lead-lined curse box in the Men of Letters Bunker storage room, and suggests they use it to hide the book. When the Winchesters finally arrive at the cabin, she hands the book to Sam and explains the book's history as he looks through it. 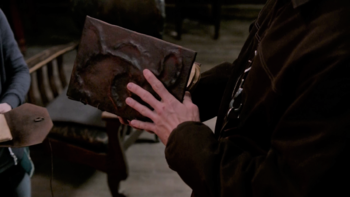 Due to the influence of the Mark of Cain, Dean becomes entranced by the book as Sam flips through the pages and when he snaps out of the trance, the book is in Dean's hands. When he hands the book back to Charlie, Dean tells them to keep it away from him while they work to translate it. While Dean researches the Styne family using the Men of Letters files, Sam and Charlie work on translating the Book of the Damned, but soon hit a wall, until Charlie realizes that the book, in addition to being written in an ancient and obscure Sumerian dialect, is also in code. Noticing Dean's strange attention on the book, Sam puts it away in the curse box and suggests they use his notes to work on the decoding for the moment. After reading up on the Styne family and their use of the book, Dean tries to dissuade Sam and Charlie from trying to translate it. Dean tells them that the book has been calling out to him and the Mark, and that he can hear it like it's alive, and that it wants him to use it but not for good. He demands that they destroy it before anything bad happens from using it before heading out to get supplies. At a convenience store, Dean runs into Jacob Styne, who has been tracking Charlie and the book. Styne and his henchman attack Dean, who manages to escape. He races to the cabin to destroy the book in a fire of holy oil. Jacob and his men arrive at the cabin and a fight ensues in which they are killed. Sam pretends to burn the book, but hides it away. Seeing the book as the only chance to save Dean, Sam decides to make a deal with Rowena to use it. Rowena confirms that she is likely the only person alive who could handle the book's power, however, she can't read it in her current state. The only person who could was a Grand Coven witch named Nadya who was murdered by the Men of Letters and her decoding codex stolen. Sam begins a search to find Nadya's Codex and locates it in the Werther Box, a warded creation of Cuthbert Sinclair. Sam and Dean manage to break the warding spells on the Box and get the codex. Sam takes it to Rowena, but locks her away at an abandoned distillery so that she will only decode the cure for the Mark of Cain, at which time he will destroy the book, though he intends to keep his deal with her. Rowena tells Sam that the language Nadya used in the codex is as indecipherable as the book, prompting Sam to call Charlie to help crack the Codex. Charlie uses pictures of the writing in the book and the Codex to search for a pattern in the book's coding and any synchronicity with the symbols in Nadya's Codex. The Styne family sends Eldon Styne to retrieve the book and kill Charlie. When Eldon is taken to the Bunker, he tells Dean that he wants the book returned to his family. Dean tells him that the book was destroyed, but Eldon tells him that the book is protected by a spell, therefore it is eternal and cannot be destroyed. Charlie eventually cracks the code on both the book and the Codex. She is killed by Eldon Styne, but not before she sends an email to Sam that contains the code breaker needed to translate the book. At Charlie's funeral pyre, Dean tells Sam to give up on his crusade to remove the Mark of Cain and promises to kill the person that killed Charlie after ripping apart everything and everyone they ever loved. Castiel looks at the pages in the book as he talks to Rowena, while waiting for Sam and Dean to return. When Sam finally arrives, Sam tells them of his intention to stop his hunt to destroy the Mark, but once he receives the email from Charlie containing the code breaker, he shows it to Rowena, allowing her to finally decipher the book. Sam decides to keep looking for the cure for the Mark in the book and tells Cas to keep an eye on Dean. Rowena says that she will start deciphering after Sam kills Crowley, honoring their deal. Rowena is seen beginning to translate the book as Sam calls her and tells her that her extra-powerful demon-killing hex bag was useless against Crowley. Castiel tells Dean that they can finally read the book but Dean, completely consumed by the Mark's power and still insistent that the cure in the book either won't work or will cost another innocent life, still refuses to let them try to remove the Mark of Cain. Rowena used the book to remove the Mark of Cain from Dean's arm. The shock wave from the spell blasts the iron chains off her arms. She powers herself up with the book to the point where her powers can affect demons and angels. She freezes Crowley where he stands and casts an attack dog spell on Castiel, ordering him to kill Crowley as she runs off with the book, Nadya's Codex, and Charlie's code breaker. Rowena uses the Book of the Damned to incinerate a trio of witches who refuse to join her new "Mega Coven." In order to get Sam a face-to-face with Lucifer, Crowley has his minions kidnap Rowena so they can use a spell to communicate with Lucifer without opening the Cage. In exchange for her help, Crowley promises to call off his assassins. With a deal in place Rowena gets to work decoding the Book of the Damned at the Men of Letters Bunker under Sam's supervision. Rowena eventually finds a spell, and along with Sam and Crowley descends into Hell to perform it. Crowley wants to make a deal with Sam and Dean by exchanging the Horn of Joshua for Lucifer's re-imprisonment in the Cage, but the Winchesters argue that they need Lucifer to deal with Amara, and they explain that they would also need the Book of the Damned and Rowena in order to imprison him. Rowena, however, sends them a message after witnessing Amara's true power firsthand and agrees to try to help them expel Lucifer from Castiel and send him back to the Cage. Rowena meets with another witch named Clea in Grand Isle, Louisiana, to ask for her help with a time-travel spell from the book that requires a second witch. As they are gathering the ingredients, the book can be seen on the table. Rowena states that the Book of the Damned is incapable of destroying the Darkness, but after they discover that a bomb made of souls can theoretically kill her, she uses it to create a crystal that can absorb the spirits trapped on earth. After he captures her, Lucifer asks Rowena to make his vessel, Vince Vincente, strong enough to hold him. She claims that she lost the book, but Lucifer doesn't believe her and states that someone like Rowena has everything from the book memorized by now. Rowena creates a hybrid spell using the Book of the Damned and Celtic magic. She claims that the Celtic sigil will strengthen the vessel and make it a suitable, permanent host for Lucifer. But when she activates it, it speeds up the decaying process, weakening Lucifer long enough for her to banish him to the bottom of the ocean. Due to Jack Kline's worsening condition, Sam calls Rowena for help and she brings the Book of the Damned. It is revealed that, at some point, it had come into the Winchesters' possession and was in the Bunker until Rowena stole it again after the arrival of the refugees from Apocalypse World. Since she claimed that she lost the book in 12.03 The Foundry, it can be assumed that the book ended up in the Bunker when they were helping Chuck battle Amara. The book can be seen by Jack's bed twice as Rowena performs a spell to examine his body and find the cause of his illness. Castiel tells Sam that he had Rowena search through the whole book to try to find a solution to the Michael problem. However, even the Book of the Damned has nothing useful to them in it and Rowena apparently cursed Castiel out when he asked her to search again. After Jack accidentally kills Mary Winchester, Sam and Dean request Rowena's help using the Book of the Damned to resurrect her. When Jack arrives with the same purpose, Rowena has just finished translating the Book of the Damned and has found a spell, the "Magice Necromantium", which can resurrect the dead. After gathering the ingredients from the Bunker, Rowena tells Jack that they need Mary's body for it to work which is impossible as Jack destroyed her body. Despite Rowena's warnings about what he could bring back without a body, Jack performs the spell anyway. The spell restores Mary's body, but fails to resurrect her. Rowena later speculates that the spell only succeeded in bringing back a shell that was incapable of containing life. When Jack realizes that the spell didn't work, he teleports away, leaving the book by the replica of Mary's body. The boys later take the book to the Bunker before returning to give Mary a hunter's funeral. The Book of the Damned is a work of nonfiction by Charles Fort and was published in 1919. The book deals with various types of paranormal phenomenon ranging from UFOs to the existence of giants and fairies. The version that appears in Supernatural has more in common with the Necronomicon Ex-Mortis from the Evil Dead film series, which was bound in human flesh and inked in blood, and written in ancient Sumerian.